Tablet sales have declined for a while now. The last time tablet shipments grew was in the third quarter of 2014. 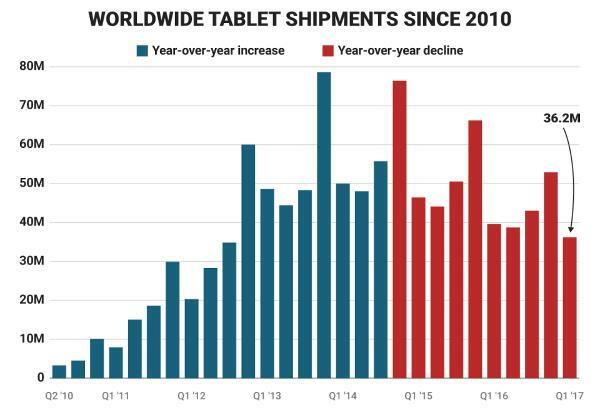 For 11 straight quarters after that, demand for tablets has waned across the globe. Sample this: In mid-2014, close to 80 million tablets were shipped, as per IDC estimates. Cut to mid-2017, tablet shipments are under 40 million. That is a 50 percent drop in very little time. As bigger (and now bezel-less) smartphones start to dominate public consciousness, tablets stand on shaky ground. They are neither as convenient as a phone nor as utilitarian as a computer. Or, that is the perception crisis they are plagued with. Every player has suffered: Apple‘s iPads, Samsung’s Galaxy Tabs, Amazon’s Kindle Fire tablets, Microsoft’s Surface Pros, etc – have all slowed. 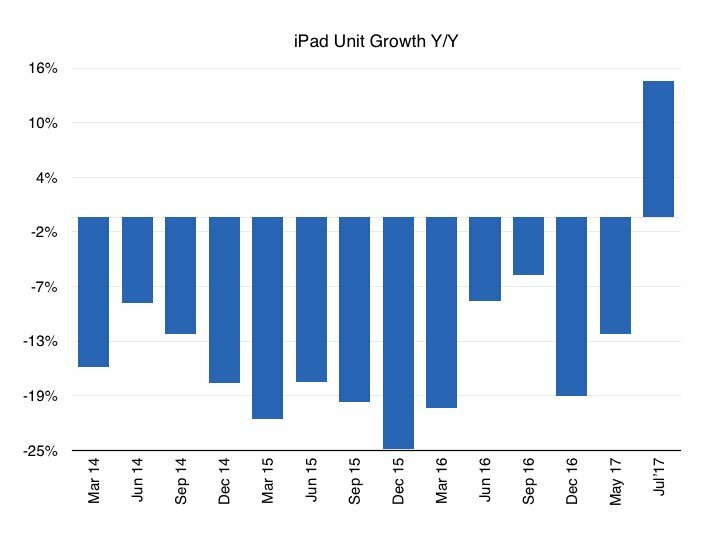 Despite Apple’s single-minded focus on elevating the user experience with every new launch, it couldn’t stall the decline in iPad sales for 13 consecutive quarters. “Apple’s results show that it is not immune to the changing dynamics of industry and consumer demand,” IDC noted in a report earlier in the year. However, Apple’s just-declared Q3 results reveal a stunning turnaround in the tablet division. iPad sales grew 15 percent year-on-year to 11.4 million units. Compared to last quarter’s sales, it recorded an even more impressive growth of 30 percent. And tablet division revenue touched nearly $5 billion. For Apple, this must be refreshing. The Cupertino-based tech giant has been criticized in the past for failing to revive the once-much-loved iPad. Surely there have been innovations, upgraded features, better design, and so on. But costs continued to be prohibitive. And larger iPhones (6 and 6 Plus onward) possibly cannibalized some part of the iPad-buying market. The rise of “convertible” touchscreen laptops too caused some of that decline, according to IDC. Conversely, Apple’s ‘detachable’ iPad Pro created much buzz. However, its high price became a deterrent. Also, lengthier upgrade cycles didn’t help its cause. iPad sales continued to decline, or as the Western media called it – they were in a ‘free fall’. However, despite its free fall, the iPad continued to be best-placed among all other tablets. Though Apple’s year-on-year decline was more than peers Samsung, Amazon and Lenovo, sustained growth in China and India ensured that it was selling more tablets than any other firm in the world. As of May 2017, Apple owned nearly 28 percent of the tablet market. (It was 24 percent in 2015.) Samsung follows with a 19 percent share, while the remainder of the top five – Huawei, Lenovo and Amazon – own 6-7 percent each, reveals TrendForce data. In the premium segment, i.e. for tablets priced above $200, Apple is a clear leader with an 85 percent share. IDC believes that the iPad Pro range, i.e. its ‘detachable’ tablets, can help Apple lead the market in future. “Apple is in a good spot to remain competitive at the top of this segment despite using a ‘mobile OS’ while many of its competitors are entering the space with Windows-based devices,” it notes. However, at present, the iPad Pro lineup accounts for a small portion of overall shipments as the iPad Air 2 and iPad Mini continue to outsell other models. For every 10 “slate” tablets shipped, i.e. the non-convertible traditional tablet, Apple sold only 1 iPad Pro tablet. That is likely to change as slate tablets are gradually becoming redundant. What really turned the tide for Apple in Q3 is the $329 budget 9.7 inch iPad that replaced the more costly iPad Air 2. Along with that, the iPad Pro 2 which was unveiled at the WWDC in June, contributed to rising sales. The market segmentation seems to have worked for Apple. While students and educational institutions – many of them first-time buyers – are lapping up the more pocket-friendly iPad, enterprises and professionals are tilting towards the Pro 2. “The approach we’ve had from a product point of view, of bifurcating iPad and iPad Pro, is really resonating with our users… Both were received extremely well and gave us the best compare on iPad that we’ve in many many quarters,” Apple CEO Tim Cook said in the earnings call. But traditionally, Q4 has been the toughest quarter for the iPad. Despite growth in sales, iPad’s share in Apple revenues rank lower than iPhones, Macs and Services (Cloud, Music, App Store etc.). Years ago, iPads accounted for the second-biggest share (after iPhones) in Apple revenues. Now, it’s down to 11 percent. While the gap between Macs (12 percent) and iPads is narrowing, and could even be bridged in future, is is unlikely that iPads would return to their past glory. However, they will most likely remain the leader of the tablet industry. And if market predictions are to be believed, the iPad Pro 2 and the 9.7 inch iPad will be star performers in future.